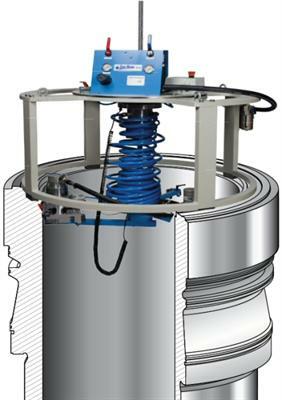 This machine has been specifically developed to provide cylinder liners with a tribologically superior surface known as wavecut pattern, allowing for better lubrication and reduced attrition. Due to the mounting adapters on top of the machine it is self-centering, highly stable and accurate. The motors are pneumatically driven and other features include water cooling system and PLC-controlled grinding depth feeding system.